Hands on: Does light Toughbook CF-W7 cut it? Panasonic has long specialised in ruggedised notebooks, but can it really keep up when laptops are becoming ever-more disposable? The CF-W7 costs £1,499 – a not inconsiderable outlay, so it’s patently obvious that you’ll need to have a cast-iron reason why you want the Tougbook. This isn’t a truely ruggedised laptop though; if you spray it with a hose it will probably die (forgive us for not testing that) whereas the most rugged lappies available won’t bat an eyelid. Mind you, even standard laptops now have a built-in drip tray should you spill your Starbucks on it. However, there is a significantly tough raft of features. The hard disk will absorb potential damage from drops while the case (although very plasticky in feel) is designed to withstand 100kg of force. The laptop is averagely specified even for an ultraportable (especially when you consider the price), with a low voltage Intel Core 2 Duo clocked at 1.06GHz, 1GB of memory and 80GB hard drive which means it zips along quite happily. But there was some sluggish use. The wireless connection often took a long time to initiate after boot-up which was frustrating - it would usually take a good while before it would connect to a wireless network. The first thing that strikes you about the 12.1-inch CF-W7 isn’t its looks, but its lightweight nature - 1.2kg - as well as its atrocious circular trackpad. We’ve seen this before on the Toughbook line and it hasn’t got any better. The keyboard is also troublesome because of the size of the keys – they’re far too small and as a result you keep pressing the wrong ones. As our reviews editor James Rivington emphasises, the case is somewhat bloated, with a bigger than average girth to absorb shocks - you can drop it from 76cm, according to Panasonic, though we didn't try that. We asked James to take the Toughbook to cover a demanding show. The body is very light which made it ideal for carrying around for long periods but is surprisingly fat - a standard laptop slides into a bag pretty smoothly. Not this one. Very cumbersome, which belies its relatively small size. The plasticky casing also feels very cheap. For a £2,000 laptop you’d expect it to not feel like an Early Learning Centre replica. The battery life is fantastic – James was able to carry it around and work on it for much of the day without plugging it in. Even with wireless turned on and screen turned up to brightest setting, the battery life was good. Likewise, our erstwhile Rivington was able to watch a movie on the plane with no fear that the battery was about to conk out. 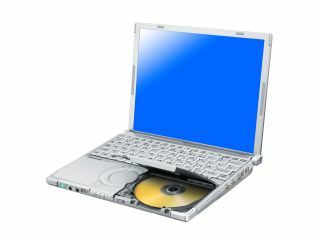 This Toughbook may not have the out-and-out ruggedness of some of its siblings, but the casing is extremely hardy. And despite our lack of qualms about performance, we’d have to say we’d expect better than a 1GHz processor, even if the low-voltage lack of speed is designed to be made up for by the excellent battery life. You’ll have to be visiting some pretty dodgy environments to make its purchase worthwhile.